This model runs in OpenCell and COR and the units are consistent throughout. It it an accurate reproduction of the paper equations but does not reproduce the published results for unknown reasons, possibly because initial conditions for state variables were guessed. ABSTRACT: We investigate bursting behaviour generated in an electrophysiological model of pituitary corticotrophs. The active and silent phases of this mode of bursting are generated by moving between two stable oscillatory solutions. The bursting is indirectly driven by slow modulation of the endoplasmic reticulum Ca2+ concentration. The model exhibits different modes of bursting, and we investigate mode transitions and similar modes of bursting in other Hodgkin-Huxley models. Bifurcation analysis and the use of null-surfaces facilitate a geometric interpretation of the model bursting modes and action potential generation, respectively. Schematic diagram of a pituitary corticotroph cell showing the transmembrane ionic currents and the intracellular Ca2+ dynamics captured by the mathematical model. Arrows indicate ionic channels and pumps. ICa-L represents an L-type Ca2+ current responsible for most of the Ca2+ influx during an action potential. ICa-T is a T-type voltage-sensitive Ca2+ current. A voltage-sensitive K+ current, IK-DR , is mainly responsible for action potential repolarisation. A Ca2+-activated K+ current, IK-Ca , is essential for bursting behaviour. The remaining leak current, Ileak , represents all other ionic fluxes across the plasma membrane which are not specifically described by the model. 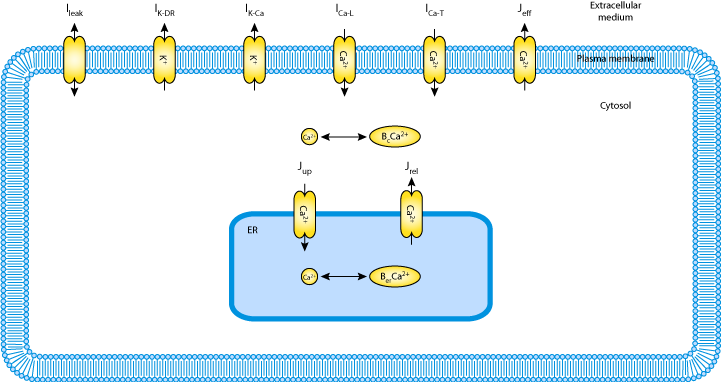 Jeff and Jup are the ER and plasma membrane Ca2+-ATPase pumps, and Jrel represents the ER Ca2+ leakage term. Within the ER and the cytosol, significant portions of Ca2+ are bound to buffers, denoted by Ber and Bc respectively. Derived from workspace Shorten, Wall, 2000 at changeset e919571d9bc2.